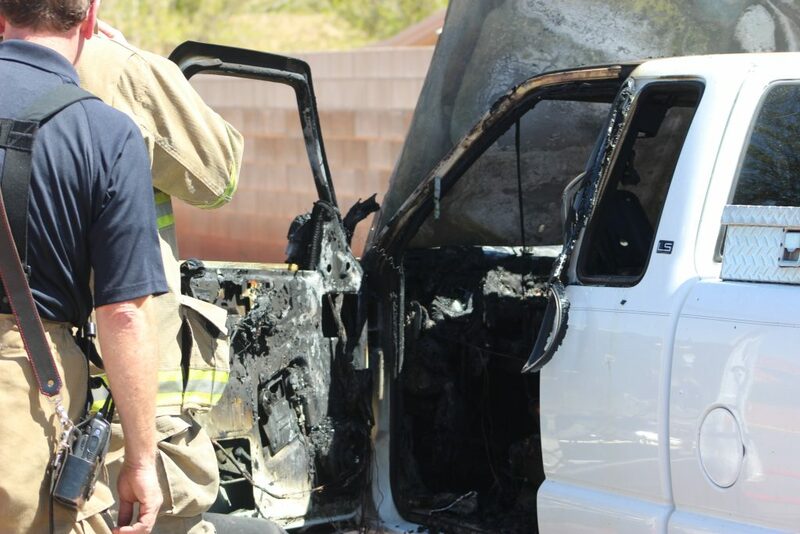 IVINS — A pickup truck was destroyed in a fire in Ivins Sunday afternoon, leaving the vehicle’s two occupants shaken but uninjured. At 2:20 p.m. officers and emergency personnel were dispatched to the fire on 400 South involving a white Chevrolet pickup truck. While they were en route, firefighters were advised by dispatchers of an explosion near the gas tank, causing the fire to spread rapidly. 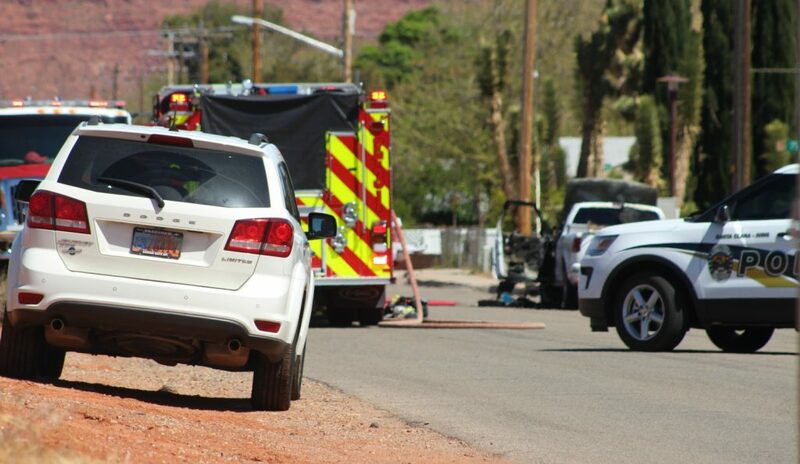 “We heard about the explosion before we got here, but when I arrived it was fully engulfed,” Santa Clara-Ivins Police officer Hope Shumway said, adding that she blocked off the street in the area of the fire as crews tended to the scene. 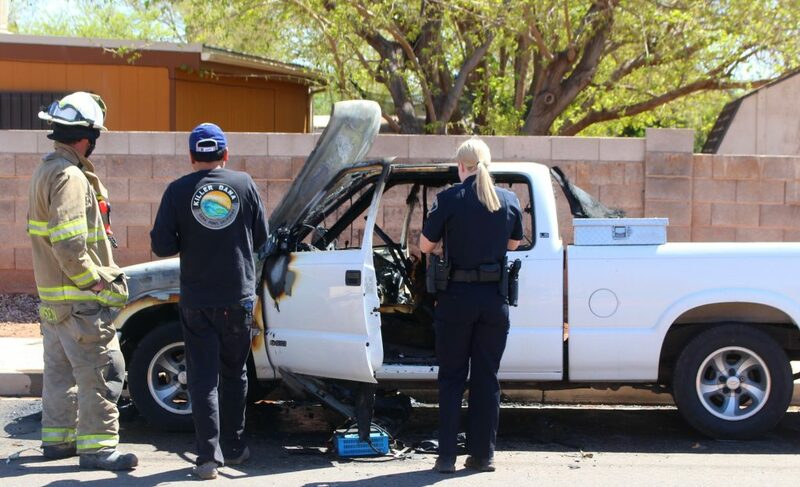 Firefighters arrived and began an aggressive attack on the fire, which was quickly spreading toward the bed of the pickup truck. While the fire was extinguished within minutes, crews continued dousing the truck in an attempt to reduce the extreme heat produced by the fire. 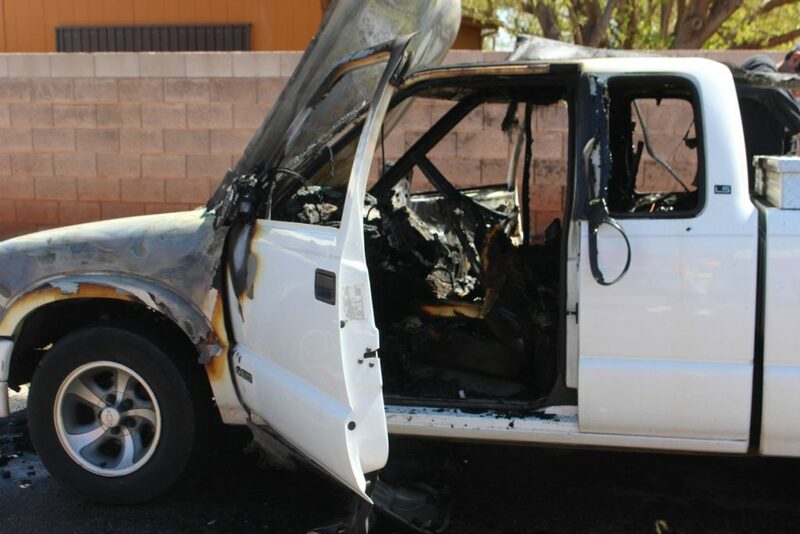 The vehicle had become so hot during the blaze that melted plastic from the light coverings dripped down the front of it. 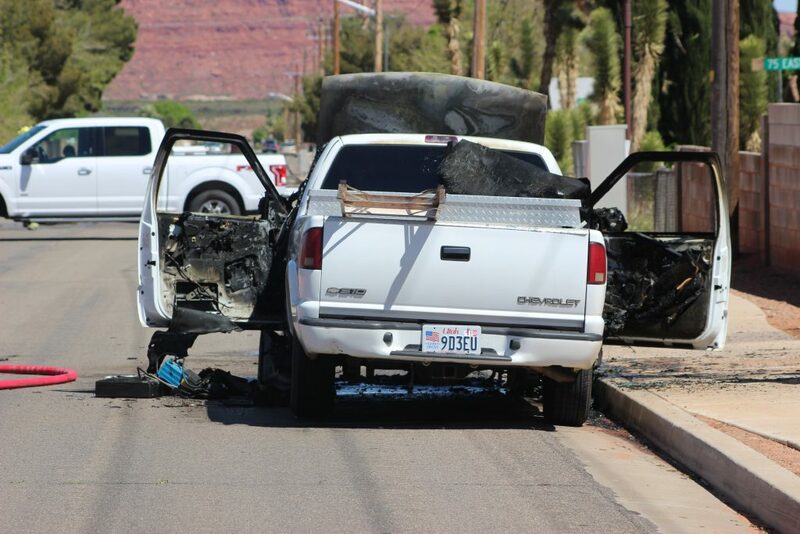 The passenger of the truck, Tomas Mendoza, told St. George News the driver was “pretty shaken up” as he removed equipment and tools from the bed of the pickup that were still salvageable. Shumway’s and Mendoza’s narratives about the fire are included in the video at the top of this report. Mendoza ran to his mechanic’s house several yards away to get two fire extinguishers, he said, explaining that he started spraying the blaze with one of them, but the other one didn’t work. “As soon as we pressed the lever, the top popped off and powder went everywhere,” he said of the faulty extinguisher. By then both fire trucks were arriving. “They jumped out and put that fire out very fast,” Mendoza said. “And these are the remains,” Mendoza said as he pointed to the charred metal. While the truck was deemed a total loss, no injuries were reported. This report is based on statements from police or other responders and may not contain the full scope of findings.